End of a Century is a collection of artwork by Bafta nominated artist Run Wrake (who sadly passed away in 2012), submitted throughout the 1990’s to accompany NME’s album reviews. 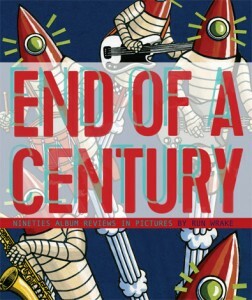 The illustrations (selected by Collins) are a mixture of stark monochrome collage demonstrating Run’s early forays in to the world of fanzine art, and more complex full colour pieces heralding the advent of computer generated artwork during the 90s. Eschewing straight forward reproductions of the actual album artwork; Run’s illustrations represent his interpretation of the music/musician in the context of the social, political and cultural trends of the time. Interestingly, as pointed out by Wrake’s wife Lisa in the footnotes, Run was given the album title and band name, and nothing else, which accounts for the abstract representations which accompanied the reviews such as the Kurt ‘Crabain’ artwork for ‘From The Muddy Banks of the Wishkah’ piece or the subversively funny Chemical Brothers ‘Dig Your Own Hole’ ‘bunny’ piece.